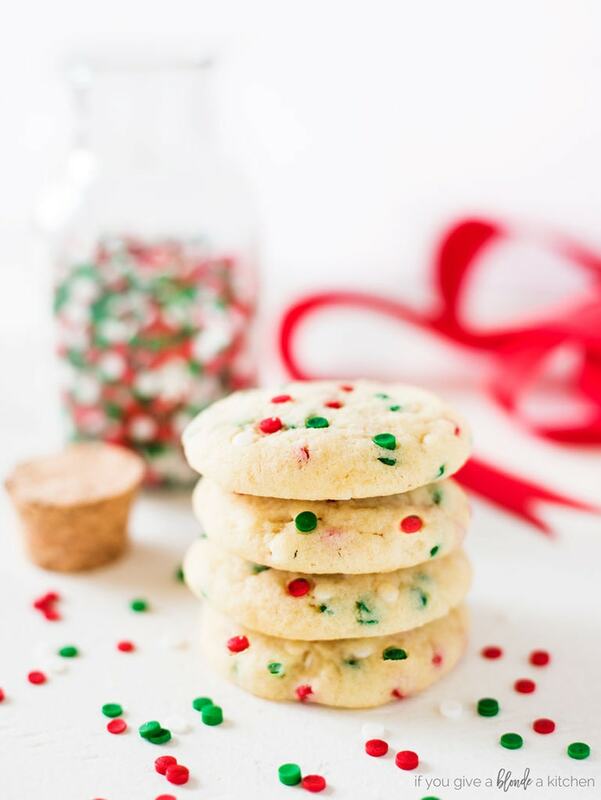 Sprinkle sugar cookies are a quick and fun recipe for birthdays and Christmas! 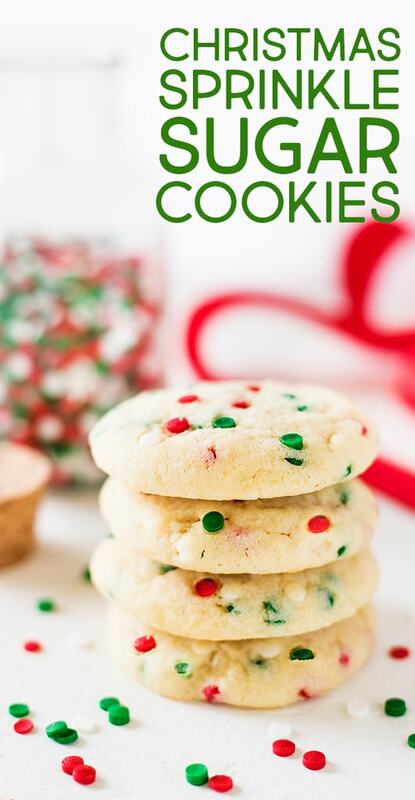 Chewy, soft and loaded with sprinkles, these sugar cookies can be made from scratch easily. I warned you that my sprinkle obsession was in full force this month. I can’t help it when my birthday is around the corner! Today I baked sprinkle sugar cookies and they instantly put me in the celebratory mood. Sprinkles get me excited and why shouldn’t they? They’re so colorful and give me every reason to celebrate. Put them in sugar cookies and this treat is just what every birthday needs. The base for this recipe is a basic sugar cookie dough. Flour, sugar, butter, eggs, you know the drill. The ratio of ingredients creates the absolute perfectly chewy sugar cookie—soft and thick with a buttery consistency. And the sprinkles blend in to the dough as if they were supposed to be there all along. To prevent the colors from bleeding in the dough or during the baking process, I suggest using these sprinkles or Betty Crocker sprinkles at your local grocery store. When I make cookies, I like rolling the dough into balls to get that perfectly round shape. Because these cookies don’t spread a lot in the oven, I had to slightly flatten the balls of dough with the palm of my hand. That method created a slight crinkle effect on the cookies, which I liked because it let some more of the colorful sprinkles come through! This is also an excellent make ahead recipe. If you have a birthday party (or other celebration such as Christmas coming up), make the cookie dough a few days in advance and store it in the fridge. All you have to do is roll the balls and bake for 10 minutes! You can also store the dough in the freezer for up to a month if you’re planning an event far in advance (or if you want sugar cookie dough on hand in case of “emergencies”). Whether you’re celebrating a birthday or an unbirthday, these sprinkle sugar cookies are worth making. Simple and delicious, they will undoubtedly be a hit at any party! 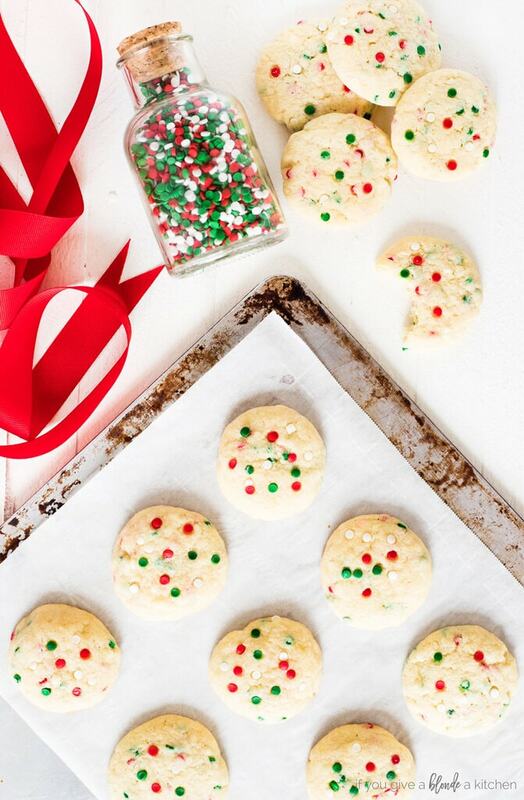 Swap out rainbow sprinkles for red and green sprinkles for Christmas time! Sprinkle sugar cookies are a quick and fun recipe for birthdays and more! 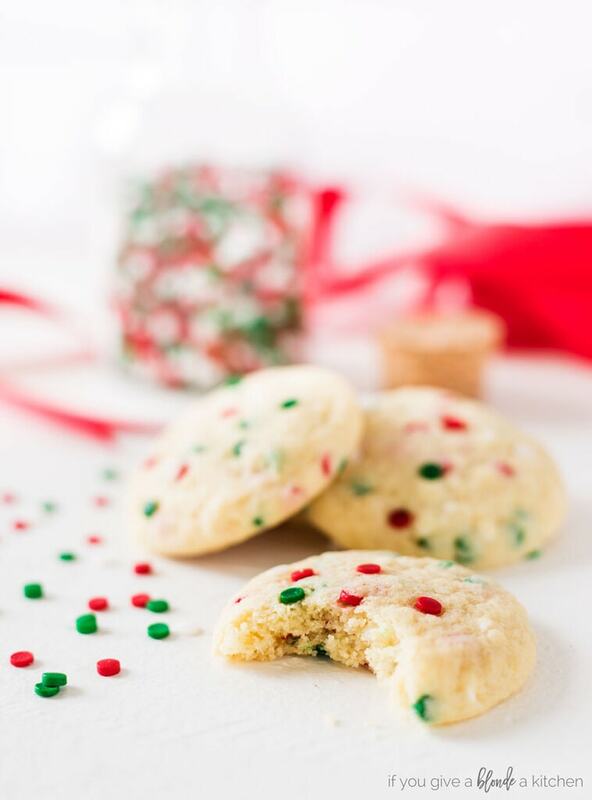 Chewy, soft and loaded with sprinkles, these sugar cookies can be made from scratch easily. Line sheet pan with parchment paper or silicone baking mat. Set aside. In medium bowl, whisk together flour, baking powder and salt. Set aside. In the bowl of a stand mixer fitted with a paddle attachment (or using a hand mixer), beat on medium speed the butter and sugar until light and fluffy, about four minutes. Add egg, egg yolk and vanilla and mix until combined, about 30 seconds. With the mixer on low, slowly add the flour mixture to the dough. Careful not to over beat. Add sprinkles and mix until incorporated. Scoop rounded tablespoons of dough and roll them into balls. Place onto prepared sheet pan, about 3 inches apart. Use the palm of your hand to lightly press down each ball of dough so they form a disc about 2-inches in diameter and 1/2-inch thick. Cover with plastic wrap and chill for 30 minutes. Preheat oven to 350° F. Remove cookies from the refrigerator, remove plastic wrap and place cookie sheet in the oven. Bake until edges just start turning golden brown, about 10-12 minutes. Let cookies cool on pan for 5 minutes before transferring to a wire rack to cool completely. Cookies can be stored in an airtight container at room temperature for up to five days. Dough can be stored in the refrigerator for two days or in the freezer for up to three months. If freezing the dough, let it defrost in the refrigerator for even thawing. Inspired by Go Gold with Butter. Yummmmmmmmmy!! I want to eat these all right now! Pinned! I love how bright and colorful those sprinkles are! Looks delicious and fun! These are so bright and pretty, and I’m sure they taste as amazing as they look! Thank you so much for sharing with us over at Funtastic Friday!